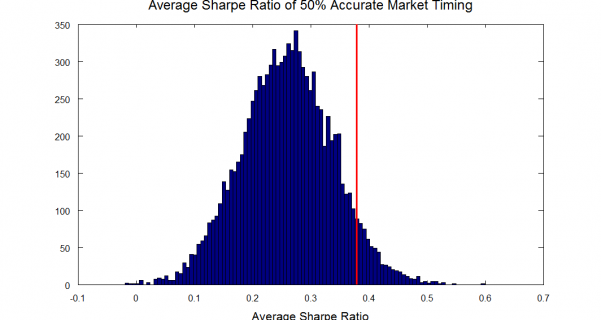 Clearly, the investor who decides between stocks and T-bills with only 50 percent accuracy has a very high chance of underperforming the market. The results do look slightly better if we compare the potential Sharpe ratios (i.e. 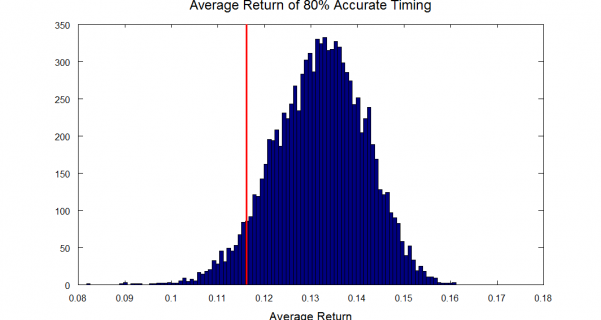 the risk adjusted return) generated by this strategy to the Sharpe ratio realized by the buy and hold investor. On average, the 50% accurate investor still tends to underperform after adjusting for risk, but there is now at least a small chance of outperforming buy-and-hold. This occurs because the investor with 50% accurate timing spends a lot of time invested in risk-free assets (T-bills). We can see that, with 60% accurate market timing, there is still a high chance of underperforming buy-and-hold. 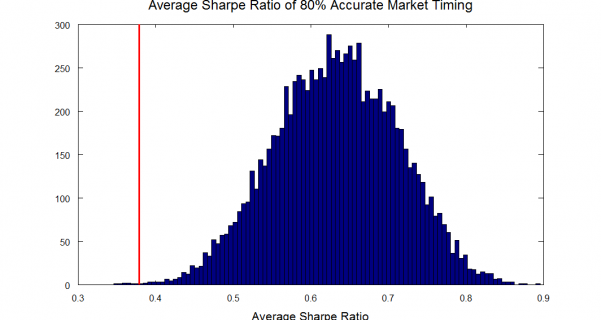 However, on a risk adjusted basis, the average results are similar to buy-and-hold. If we examine the 1926-2010 return data closely, we find that the stocks outperform T-bills about 67% of the time, so the buy and hold investor who holds only stocks is actually invested in the higher performing asset class about 67% of the time. 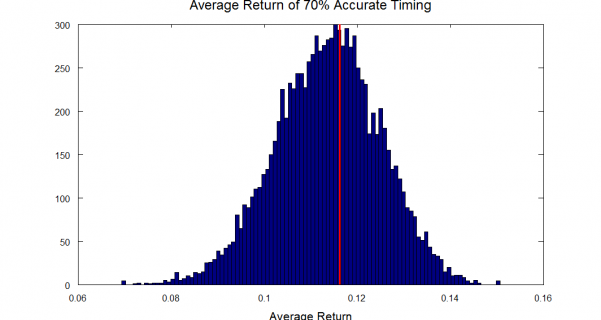 For this reason, we might expect that as accuracy goes to 70% we will see the average returns of the market timer outperform the buy and hold. 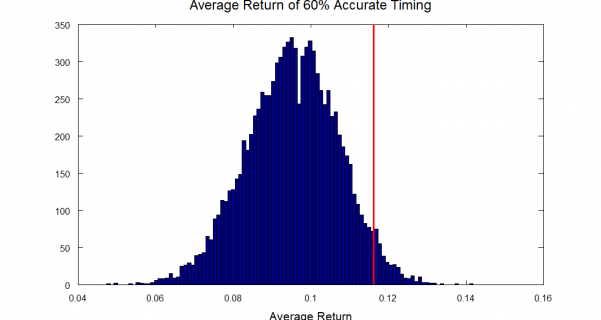 These simulation results show that the average returns of a market timer with 70% accuracy still underperform the buy and hold investor slightly over half the time. This is true even though the buy and hold investor is correct only about 67% of the time. The reason for this result is that the gain in return, when the investor correctly picks T-bills over stocks, is less, on average, than the loss of return when the market timer incorrectly picks T-bills over stocks. 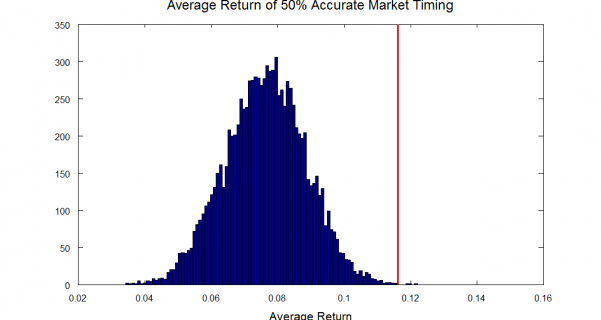 With 80% accuracy we finally see the market timer outperform the returns of the buy-and-hold investor. However, note that, on average, the return is less than 2% higher. Therefore, if the market-timer is paying an advisor 2% of assets for timing advice, then even 80% timing will not be good enough! 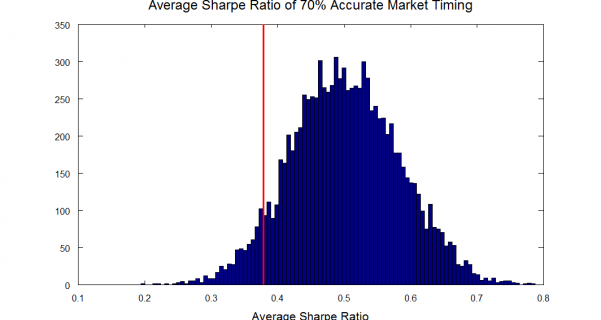 This analysis illustrates the difficulties faced by an aspiring market timer. A very high accuracy is required to beat the buy and hold investor in terms of raw returns, and an even higher accuracy is required if we consider additional costs such as management fees or trading costs. Our simulation results support Sharpe’s conclusion that the minimum accuracy required is over 70%. 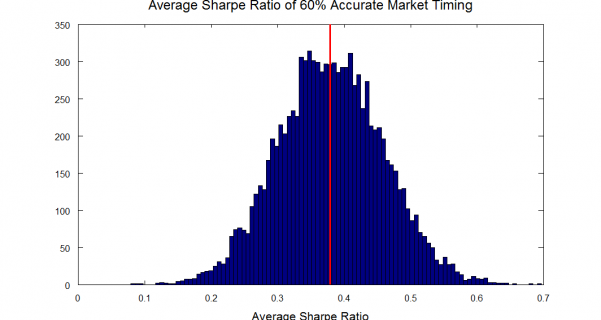 On a risk adjusted basis, the results look better, but we still need an accuracy of over 60% for market timing to pay off. The data for this analysis is from the Kenneth French website. The annual returns were extracted from the Fama-French Factor Data, and stored in a file named “F-F_Factors_annual.txt”.